would in a standard key operated scroll chuck. This chuck gives you the possibility if you have the capability. Ideal for professional turners as a time saver. 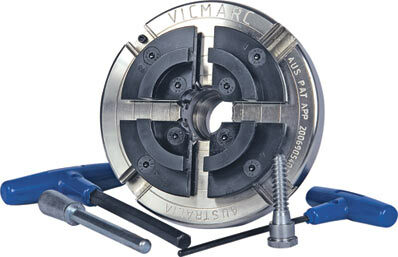 Vicmarc designed saftey ring allows you to turn in reverse without the chuck coming undone from the spindle. The VM150 chuck is 150mm (approx 6") in diameter and accepts the same Jaws and Inserts as a VM120 or a VM140. For insert type chuck, an appropriate insert to fit your lathe is required. Click here for the list of Inserts available for most threads. The below video demonstrates how this dual action Chuck works.